I’ve done a lot of recipes over the years, and I’ve said that many of them are my favorite. 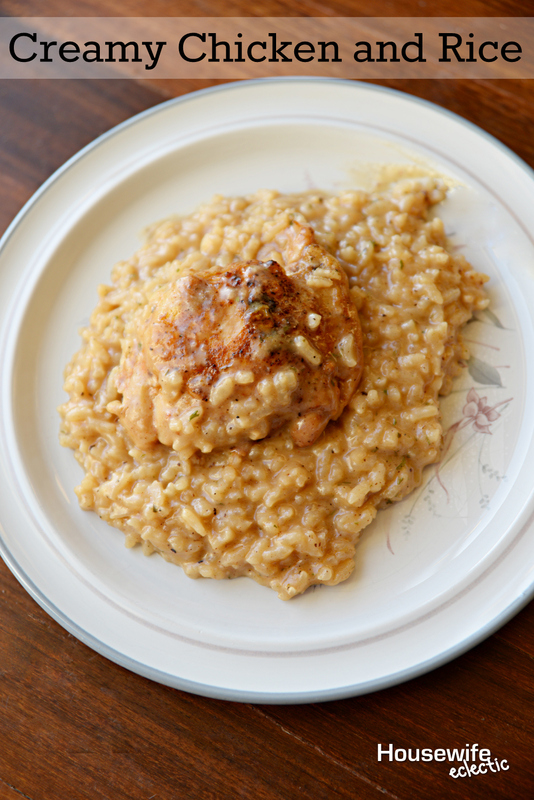 But, for real, this Creamy Chicken and Rice recipe really just might be my favorite. Chicken and rice is one of the most basic, yet satisfying, meals out there. I’ve made many different versions, but there’s something about this creamy recipe that puts it over the top. This dish is packed with flavor and feels much more elegant than a chicken and rice dish. OK, enough chit chat. Let’s get down to the recipe. Create a dry rub for the chicken by combining lemon pepper, garlic salt, and paprika in a bowl. Sprinkle the rub over both sides of the chicken and lightly pat. In an oven-proof pot, warm olive oil on medium heat. Place each chicken thigh in the oil, skin-side down. Cook for 3-4 minutes, then turn up heat to medium high and cook for another 2-3 minutes. Then turn the chicken over one more time and cook for another 3-4 minutes. The chicken should be fairly browned, though not fully cooked. It will finish cooking in the oven. Remove the chicken from the pot and set aside. Add 2 tablespoons butter to the pot and melt over medium-high heat. Saute the garlic in the butter for about a minute. Pour in the rice and saute for 2-3 minutes. Pour in 1/4 cup chicken broth and 2 tablespoons lemon juice. Cook for another couple minutes before pouring in the rest of the chicken broth. Add one cup of milk and salt and pepper. Stir and bring to a simmer. Return the chicken to the pot amid the chicken. Place the lid on the pot and bake at 350 degrees for 20 minutes. Remove the lid and continue to cook another 10 minutes. Remove the chicken and place on a baking sheet. Broil on high for 2-3 minutes, browning the skin. Finish the rice by stirring in 2 tablespoons butter, Parmesan cheese, and 1/2 cup milk. Stir until well combined. Top with parsley. The strong lemon flavor works so well with the creamy nature of the rice. It’s a flavor-packed dish that is equally great for a family dinner, or for entertaining guests. That sounds so good. I am sure that my entire family would enjoy this meal. It sounds and looks like real comfort food! I love lemon in anything, so that really woke me up when I saw the lemon addition! I like that lemon is added to this recipe as I am learning the benefits of using lemon on food and even as simple as drinking lemon water. I like that it is simple and easy. Will be trying it. OOoh I could make a really great Quorn version of this. I love creamy veggie chicken but never tried making my own! Wow this looks so yum. I love the fact that it doesn't have a bagillion ingredients too. This looks really good! And, even better – easy to make. I bet my famiy would eat it up. This looks so delicious! I'm going to have to try making this! I love lemon pepper, is one of my favorite flavors. This looks really simple and good. Going to save because chicken and rice are favorites. Oh this looks really good! I love anything with chicken and so does the family so I'll be giving this a try. I'm sure we'll love it. Yummy delicious and the addition of parmesan sounds interesting. I've made chicken rice before (my mums favorite) but I'm thinking that addition might just kick it up a notch. Looks delicious to me. I've been liking a chicken and rice dish I've been making lately. I need to add some veggies to it though. This looks so good! I love chicken and rice but I always like to make different variations so this is perfect! Yumm! This looks like something my husband and I would enjoy. I love "cream of" whatever recipes, but not the yucky canned flavored cream. This looks like it has the great taste without the yuck. Chicken and rice sure do make a great meal. You have got me wanting some of it now! I'm not usually fond of overly rich dishes, however I think with some substitutions I could make a vegan version with Gardein chicken. Yum! This looks awesome! Definitely something that my family would enjoy, and so simple! That looks so delicious. I sooo want to make this! Looks like a dish my family would love. And I love that it's easy to make. I just had dinner, but this sounds so good that I'm hungry just thinking about it. I'm pinning it! Yum! I used to think i didnt like cream corn but I really do now. I never had creamy rice but now I am interested in the concept. I don't eat meat, but this recipe looks delicious in every sense of the word! My family would enjoy it. I can't wait to try this recipe! We eat chicken and rice pretty regularly, but I never tried this version. It looks delicious! I love recipes for creamy dishes that don't use canned soups. I think this would be a hit with my kids. I will add it to the next week's schedule. This looks amazing! Do I have to use sushi rice or can I use regular rice. This would be great for my kids! This looks delicious and I love how you plated your meal. What a great photo.